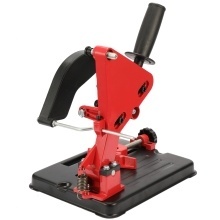 Angle grinder stand can be used as a simple cutting machine by clamping an angle grinder. It can be fitted for 100mm, 115mm, 125mm angle grinder. Protective cover design is safe and reliable. Aluminum bracket with a plastic anti-skidding handle for better cutting control.